May. 26, 2016, 11:32 a.m.
Matthew Kay witnessed the scene from Nomad Pizza. He was there for an early happy hour. He’d eaten and was getting ready to pay his bill when he heard a scream from outside on Locust Street. He took the picture that’s been blowing up your Facebook feed all day today. The bus driver, Kay said, tried to wave the cyclist off as if to apologize. The cyclist proceeded to dismount from his bike, cross his arms and stand. And he stood for a very long time. The cyclist was ahead of the bus going east on Locust Street, and a truck that was in the parking lane obstructed their way. The cyclist moved slightly to avoid the truck. The bus moved over as well and passed the cyclist at the same time as the cyclist was passing the truck. Showell-Lee said the driver left “plenty of room for everybody.” Pennsylvania law requires drivers to allow four feet of space when passing bicycles. The cyclist then pedaled quickly to get back ahead of the bus. He stopped in front of it and continued standing there, halting the bus. 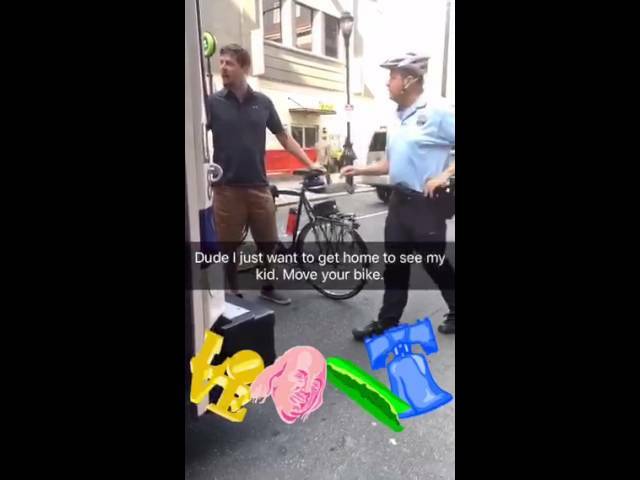 SEPTA was not able to get the name of the cyclist. Showell-Lee said he could have faced a charge of “interfering with public transit,” a summary offense. The video was not made available to Billy Penn but Showell-Lee offered the opportunity to view it on Tuesday. Though Kay had finished eating, he stuck around to watch. So did other patrons at Nomad. The bus driver, Kay said, shrugged and parked the bus. As the standoff continued, passengers started getting off the bus and others started getting on, unaware of what was happening. When the bus driver tried to back up and move around the cyclist, he moved back into the way, an action confirmed by Showell-Lee. At one point, the cyclist pulled out his phone and held it up to the driver as if to indicate he was calling police. That may have been the case because the police eventually arrived. Well, one police officer. On a Segway. Kay said the officer spoke with the cyclist and then with the bus driver. Finally the cyclist relented. Showell-Lee said SEPTA was not made aware of the incident Wednesday and received no report of service being disrupted. She said it came to their attention after a Facebook post. A spokesperson for the Philadelphia Police Department said a 911 call came in for the incident at 5:03 yesterday afternoon. She said by the time officers arrived on the scene — about 30 minutes later — the incident had ended. On Facebook, the story garnered mixed comments from a group that generally supports biking and alternative forms of transit. Kay said he was shocked at the cyclist’s actions. “You don’t know if people are on the way to a job interview on that bus or are diabetic and need medicine,” Kay said. “He didn’t care about anyone. 11:45: This story has been updated to include comment from the Philadelphia Police Department. 5:00: This story has been updated to include news SEPTA plans to investigate the incident through video footage. Friday, 12:40 p.m.: This story has been updated to include video footage from the cyclist’s encounter with an officer. Friday, 2:20 p.m.: This story has been updated to include SEPTA’s comment after reviewing footage of the incident.